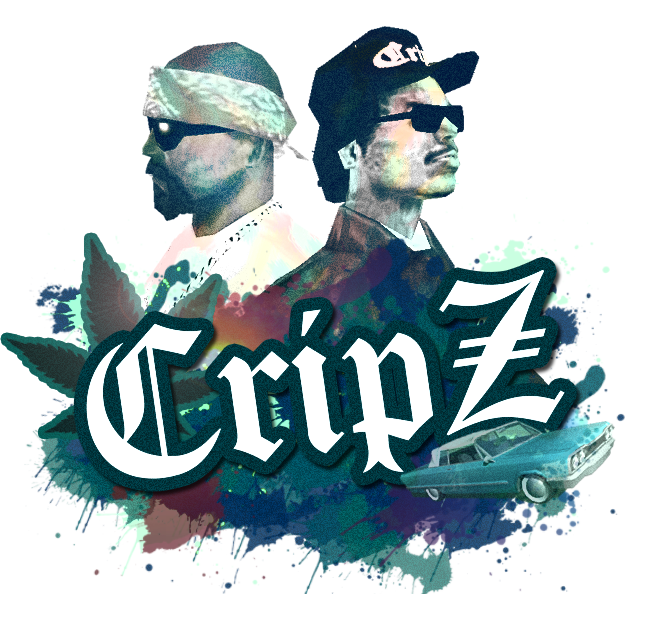 With the profits made with the drug business, CripZ was able to create an alcohol industry. Alcohol is distributed to friendly and neutral gangs in big quantities through independent shippers like truckers under threat and the gang resources. The alcohol is produced in San Andreas, with a decentralized system. The production areas can be found in old abandoned factories, undercover business and several flats and houses in CripZ territory. Those production areas which aren't within the limits of the CripZ's territories are used as hidden business for the distribution of the alcohol in a legal appearance. The agricultural products required for the alcohol making can be found in Flint County farms, where farmers get a good profit for their harvest and gladly cooperate with the gang. When the production in Flint County isn't large enough, the resources may enter legally through Los Santos docks or illegally through small airplanes which land on lonely areas coming from other countries. The products coming from Flint County come in a totally legal way, those who come through the docks often require bribings and the airplane smuggling is done totally against the laws. The legal transport is done in a fast way. The transport of the illegal products to the production area is done through bribing of local departments to avoid highway patrols or through fake load papers provided by the mafias which get a profit with other CripZ's activities. Sometimes the risk is taken, and truckers are sent with illegal loads, but the price of the alcohol is risen. At the production areas the agriculture products are transformed in the required alcohol and bottled. These bottles may receive fake labels of famous alcohol brands that easily go through the checkpoints or be transported in the same way as agricultural products, with the help of bribes and fake papers.Alcohol is delievered safely and prize is variable depending on the money used for the transport, which is often very small compared with the huge profit obtained with the selling of the product. The majority of vehicular theft around SA are carried out by us. We externally ship vehicles, parts and illegally modified bespoke engines, tailored to meet the exact requirements through job production. Disassembly of common branded vehicles are performed for recreation of our own vehicles, in which has superseded the automotive industry, rendering our vehicles to be distributed at the highest price on the black market. Smuggling these vehicles globally to become renowned throughout all prestigious gangs is our goal. Primarily, our main contract resides in the legal partnership with the renowned party – Cuban Liberation Organisation. We have our own garage which serves a specific purpose and service to each and every organisation that we sell to. In exchange, we have been met with an agreement in order to be provided with security and weaponry, whilst manufacturing mechanical parts. Whilst vehicular manufacturing is our primary concern, carjacking is widely carried out throughout San Andreas. They are then taken to private garages, these are either sold on very quickly or have been re-modified to make the car discrete. We have contracts with the licensing agency to provide alternate registered license plates. We are also in the habit of providing security vans, made to sustain military grade weaponry and explosives. These are provided to organisations that can do as they please. CripZ was already doing little security, transportation and sometimes being the middleman in a drug deal.But they wanted to do more than that over time. After gaining a big profit from moonshine and illegal vehicles. They were looking to expand the gang income because CripZ was a developing gang and its expenses were too big. So they sent their scouts around San Andreas to get information about the drug thing. The scouts were reporting that drug business can be really interesting and profitable if the managing person can play the right cards. 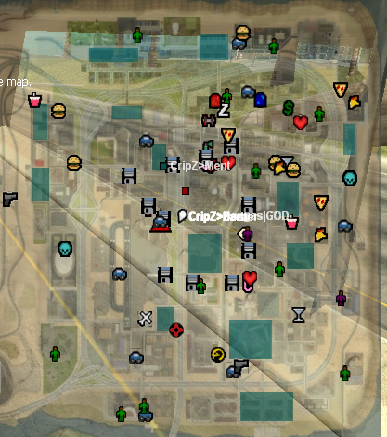 CripZ had to expand its self if they wanted to have respect all around the San Andreas. So they started by buying little amounts of drugs from local dealers and dealing them at other places while other respected members set up a factory to produce drugs and find a safe way to transport the drugs without the police noticing. ROLEPLAY STORY : A few days ago, I saw a truck going with a lot of crates on its trunk written army on crates. But I was sure about that the driver wasn't from army nor working in army. After 2 days I heard that truck is owned by The Company, the crates were moving by their members to their place. I thought they were going to use them for themselves but when I heard the crates are for sale, I had a friend inside, called him and wanted to make a deal about the weapons. The weapons were valuable, hard to find. As they are either stolen or bought from the army, no idea however that happened but anyway. I took one of my friends and went to their place. I talked about the price firstly, they were selling them for cheap. I decided to buy dirrectly, didnt want to lose that chance. Went inside their building and saw the crates and weapons in it. We bought assault rifles and SMG with their bullets. We paid the cash & took crates back to our place succesfully. ROLEPLAY STORY : It was a rainy day, we were about to go to a deal with Black Bullets. As we bought a few weapon crates from another organisation for a fair price, we decided to strengthen our power by upgrading our weapons. After searching in the country, we decided to contact one of their member named Nicky. We went to deal as 8 man, he was alone. He was uneasy, I just realized after seeing his face. But he probably had a few guys covering him on mountain. Anyway, after having a talk, we took the silencors and extended magazines and gave him the cash after the deal. He went back to his place as soon as possible. He probably was scared while making a deal against 7 man as alone, but everything was done succesfully for us and for him. 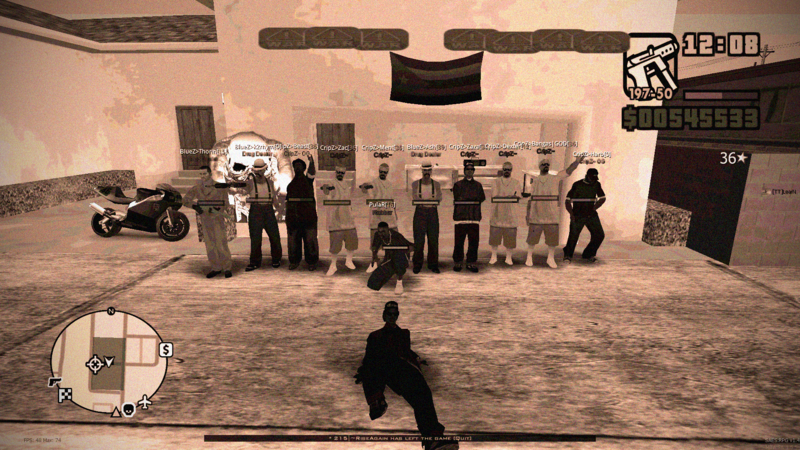 ROLEPLAY STORY : A motorcycle club named Blood Brothers called me for a few crate of drugs. I told them to visit me whenever they are able to. It was a sunny day, they called one of my friend to say that they will be visiting us today for the deal. We took the cars which including drugs on their trunk and parked them, then waited for BBMC to arrive our place. When they came, we talked about the price, they said they will be buying 10 crates, I told one of my gang member to move the crates to their truck. meanwhile we were talking about their club, he told me that they will be buying more stuff from us so they wanted us to discount the price for them, I told him to dont worry about the price, after they moved the stuff, they went back to their place. PARTICIPANTS : @FastYounq @chemist @Filex @SoulFly. PARTICIPANTS : @Reggi , @ziad-i . RP Scenario: Yesterday i was in my garage and i got a call from CripZ>Djappa~ He wanted me to go and see what the problem was with his car , he told me that was an accident in the lv-ls highway , so i bringed my towtruck and i went to the incident, The accident happened with a truck , i got the car to the garage , when we arrived i started checking all the problems. I found too much things are broken like the hood the doors engine and the tyres are damaged too. I got the necessary tools and started working ..
the job took 3 hours or more to repair and fix everything then Mr Djappa has comeback to my garage and he saw the car has been fixed and its ready. He paid me and he's gone.